2013 was a warm and very dry vintage at Parawa without heat waves. Foggy Hill received 1301°C days of heat over the 2013 growing season against the long-term average of 1135°C days and received a meagre 63% of normal growing season rainfall. Early season warmth accelerated the growth and fruiting processes at Parawa ensuring an early harvest but the moderate summer day temperatures of the very maritime Parawa climate, preserved the fragile and delicate aromatic Pinot Noir varietal character. The small black bunches of Foggy Hill Pinot Noir were hand harvested on the 6th of March, 2 weeks before the normal harvest date. They were transported to the Tapanappa winery in the Piccadilly Valley where the grapes were de-stemmed, crushed and chilled to 0.8 tonne open fermentation tubs containing 15% chilled whole bunches. After 10 months in barrique, Tapanappa Foggy Hill Pinot Noir was clear racked and bottled in February 2014. 2013 Tapanappa Foggy Hill Pinot Noir is the product of a warmer than average vintage from the very cool Foggy Hill Parawa site. 2013 vintage is proof of the adage that the best wines come from the coolest sites in the warmest years. The colour is dense by Pinot Noir standards reflecting the sunny vintage effect on berry pigmentation and the effect of plucking the leaves from around the bunches before veraison. The fruit aroma is of ripe and spicy black berry-fruits with floral and notes that contribute to Pinot’s “peacock’s tail”. The palate has intense and sweet fruit flavours reflecting the aromas that persist but with very definite tannin structure that provides a savoury finish. 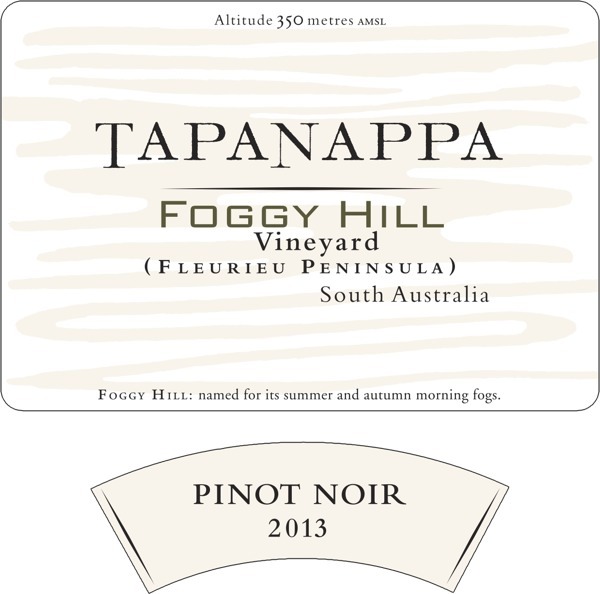 2013 Tapanappa Foggy Hill Pinot Noir is “a pure expression of the unique terroir of the Foggy Hill Vineyard”. Bottled on the 17th February 2014. Only 1,800 dozen grown and made.